(Warsaw, NY) – The Wyoming County Chamber & Tourism office is pleased to announce the release of the official 2019 Wyoming County Visitor Guide. This year’s guide features a new cover photo donated by local resident photographer Christy Hibsch, depicting a sunset scene of the new Genesee Arch Bridge over the Middle Falls. The cover shot once again beckons readers to visit the “Grand Canyon of the East” and the many adventures that Wyoming County has to offer. The 2019 visitor guide offers readers an engaging visual experience, while providing valuable travel and hospitality information to tourists and residents, and the 700,000 visitors to Letchworth State Park each year. The visitor guide is also linked to the Wyoming County Tourism website GoWyomingCountyNY.com featuring an interactive and fully mobile platform, a new Letchworth State Park information section, travel itineraries and trails, events calendar, maps and business listings. “On behalf of the membership and Board of Directors, I would like to extend a special thanks to Eric Szucs for his hard work to deliver a great looking product for the 2019 season,” said Chamber CEO Scott Gardner. “I would also like to thank all the businesses and advertisers in the guide, and the following who assisted with their time and talent this year: The Warsaw Penny Saver for the design of the guide; Christy Hibsch for the beautiful cover photo, and to community members who continue to share great photos with our organization. The Chamber & Tourism office printed 100,000 copies for distribution this year, which will be handed out at nationwide trade and travel shows, and sent to information centers and rest stops across New York, the Northeastern United States and Southeastern Canada. 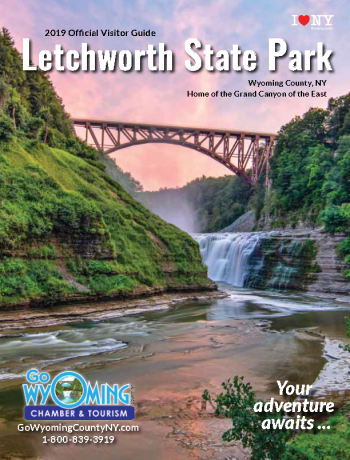 Visitor guides will also be available at the gates to Letchworth State Park and at local attractions, government offices, restaurants and retail locations throughout Wyoming County. Guides may be picked up at the Chamber office located at the Wyoming County Ag and Business Center, 36 Center Street in Warsaw. Area residents are encouraged to call, stop by the Chamber office, or arrange to have a visitor guide mailed free to friends or family who may be interested in Wyoming County. Area businesses who would like to have a supply of visitor guides at their location are also encouraged to contact the Chamber at (585) 786-0307 or info@gowyomingcountyny.com. The Wyoming County Chamber & Tourism is the leading membership organization for local and regional growth, advocacy, and connection for Wyoming County’s business community. The Chamber & Tourism’s mission is to serve the members and community; promote and grow the County’s economic and tourism assets as the official Tourism Promotion Agency; and work collaboratively to create an environment that leads to the success and economic prosperity of Wyoming County. For more information or to become a member please call 585-786-0307 or visit the website at www.wycochamber.org.